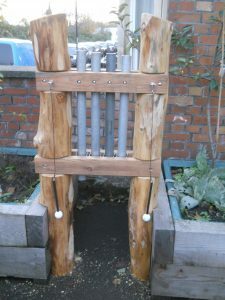 St Werburghs Community Centre in Bristol have been redeveloping a car park as a play area and asked if I could make some ‘sensory structures’ for the area – which gave the chance to make musical instruments! Researching how to make and tune them was a fascinating process. 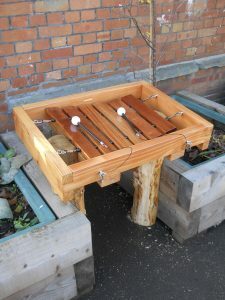 It was made a little trickier as I wanted to use reclaimed timbers to make some of the wooden parts. 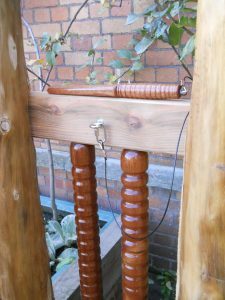 The larger companies around my workshop sometimes get deliveries of timber on bearers made from offcuts of sapele wood – a tree that grows in tropical Africa. Although many are reused by those companies when stacking timber for storage, it seemed a real shame to waste any of the used bearers by burning or throwing them away, especially as sapele is a great timber to use for xylophone bars. I’m very glad to have found a better use for the wood. 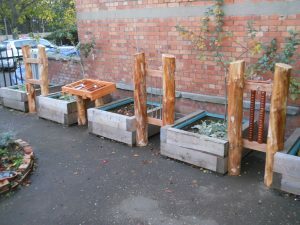 The beautiful locally-grown larch posts holding up the instruments were provided by Tom and the team at Roundwood Design. A set of four tuned metallophone bars, made from discarded ends of scaffold pole. 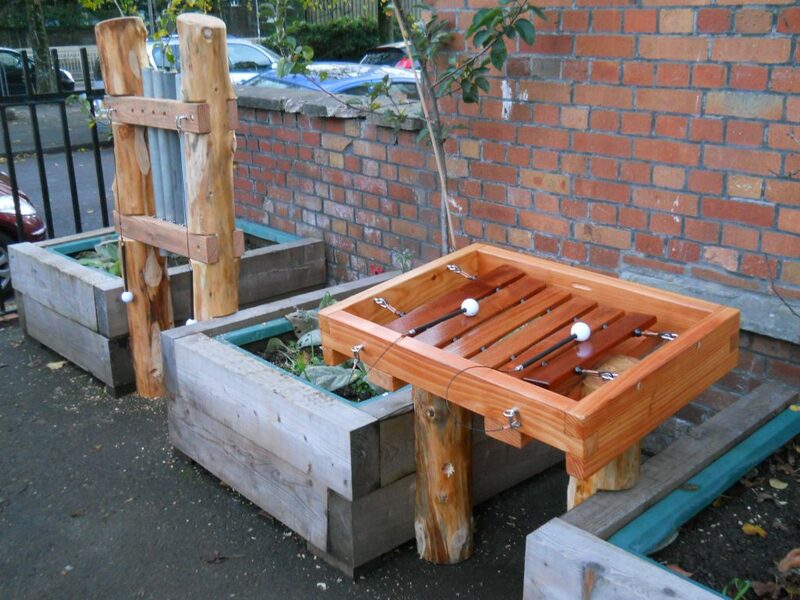 The limited space between the existing planters meant that the instruments could only be a certain width. I also made the beaters to play the bars, using golf balls on aluminium rods. 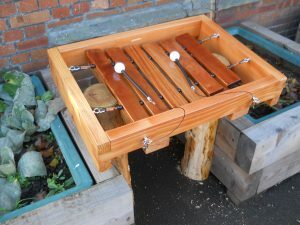 A tuned xylophone was probably the most difficult thing to get right; especially as there is a certain amount of wastage when using reclaimed materials due to imperfections and damage in the wood. I’m very happy with how it turned out and would like to explore the idea further, perhaps by carving the bars into interesting shapes. The next instrument was made using stainless steel threaded bars and washers. 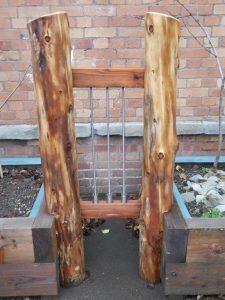 The washers slide down the bars, making a sound a bit like a rain stick. It’s strangely fascinating to watch them as they move downwards, glittering in the sun. The final instrument is something I call ‘rattle poles’. 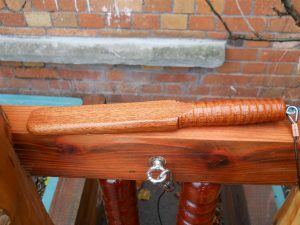 These were turned from the sapele bearers, with a stick to play them that was also turned using reclaimed timber from a bearer. The two vertical sticks were the largest turned wooden items that I’ve produced so far. 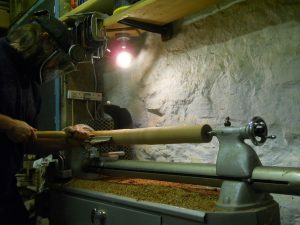 It gave me a chance to get my vintage Myford ML8 lathe fired up, which was great fun. 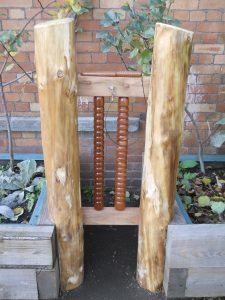 I think that the finished turned sticks look beautiful, especially against the rustic larch poles. It’s a lovely thought that these musical instruments will provide fun for children and their parents for many years to come. What do they sound like, you may be asking? There’s a Youtube video which will show you.